Right after the Annapolis sailboat show last fall (2018), I had the chance to go for a sail on the brand new Island Packet 349 that had debuted during the show. 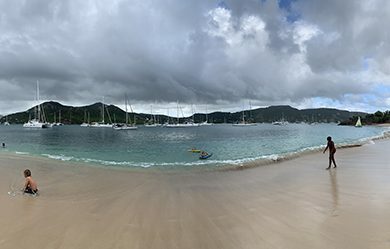 I had visited with the owners of IPY, Darrell and Leslie Allen, at their stand in the show and had witnessed what had to be an amazingly enthusiastic welcome for the new boat from dozens and dozens of Island Packet fans. 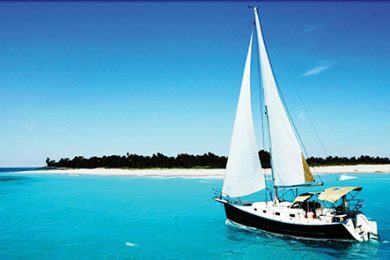 There is no question that since the company was founded in 1979 that the boats and the people associated with the company have built a true family of faithful followers who are really into cruising and proper offshore cruising boats. 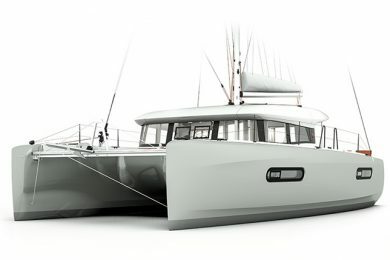 The new 349 is very much a chip off the old Island Packet block, with its Full Foil keel, attached rudder, full bodied hull, cutter rig and bow sprit. And, the beige colored gel coat that makes IPY boats stand out in every anchorage. I found Darrell and Leslie aboard the boat in the Port Annapolis Marina. 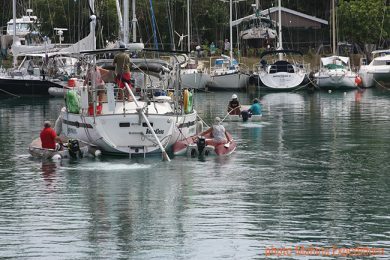 We fired up the engine and easily slid the boat out of its tight berth and into open water. It was a beautiful sunny day, warm and almost windless. We motored down the creek to the Chesapeake Bay and got a feel for how the 349 handles under power. The 45-horsepower diesel was turning a three-bladed prop so we had plenty of power. 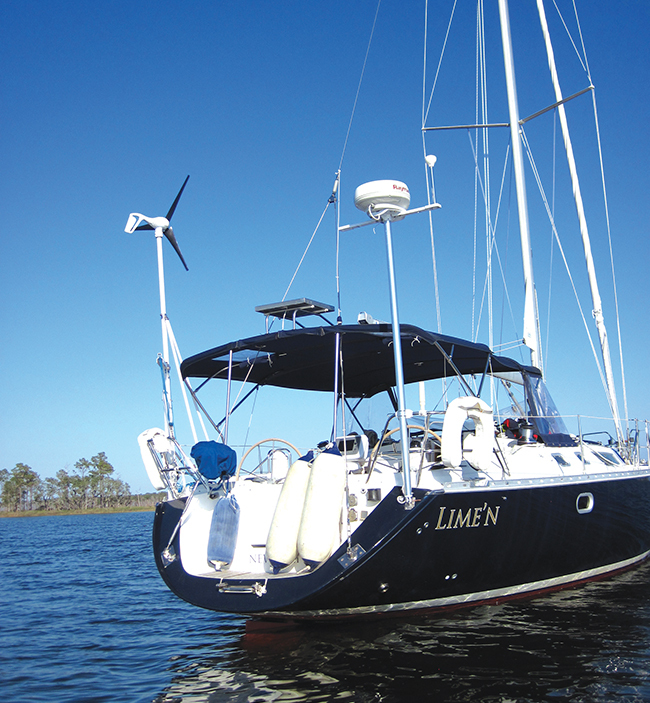 The boat turns deliberately and with the aid of a bow thruster will be easy to maneuver in tight quarters. The 349 has a 32-foot waterline, so it’s nominal hull speed will be about 7.5 knots. 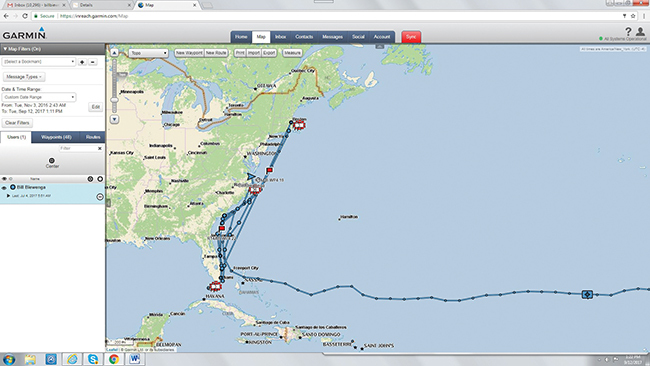 At full rpms, we got her up to this speed without much fuss in the flat water of the bay. The 349 carries 55 gallons of diesel in her tanks. At a cruising speed of six knots, the engine will burn about half a gallon of fuel an hour, which will give you a safe motoring distance of over 500 miles. That’s pretty good for a 34-footer. We hoisted the main and rolled out the genoa and did our best to get a feel for how the new boat sails. With only five to eight knots, we didn’t expect too much of a thrill. But, I and I think Darrell and Leslie were pleasantly surprised at how the boat responded to the breeze. 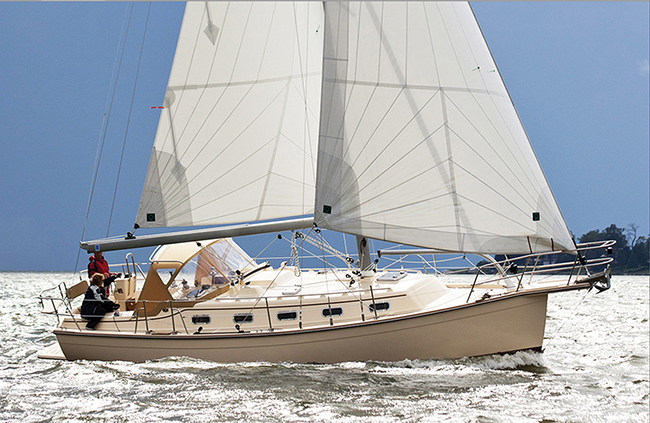 The design has a full keel, a displacement of 19,300 pounds and ballast-to-displacement ratio of 39%. 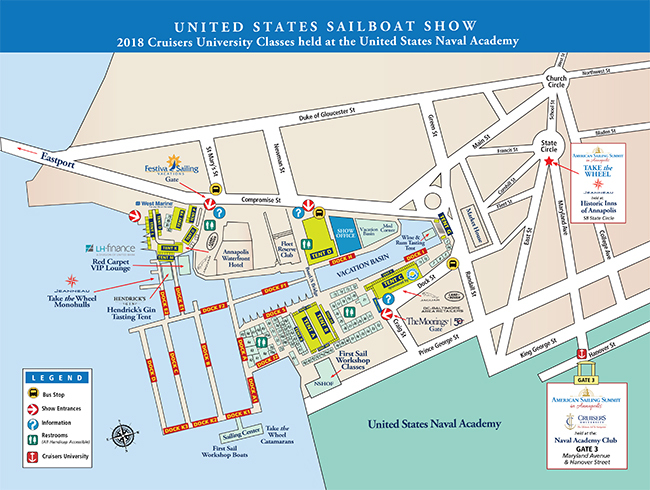 All of that indicates a boat that will need a real breeze to drive her and indicates a boat that will be comfortable and safe at sea. It doesn’t explain how the 349 actually sails. In the light breeze with just the working sails set, we got her sailing at four knots on a close reach, which I think is more than satisfactory. We made a few tacks and found that in the light stuff she would tack through about 95 degrees. With a bit more breeze, she will sail a bit closer to the wind. 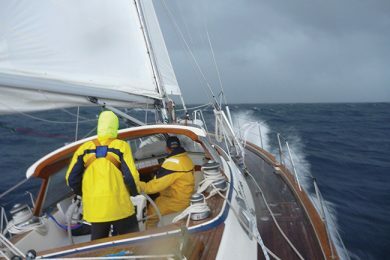 When we fell off the wind and the apparent wind died, we were still able to keep her moving at three to four knots until we were actually dead downwind. 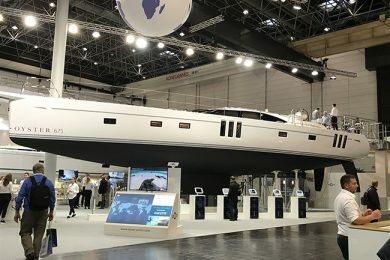 The boat’s cockpit is large for a 34-footer and laid out for easy line handling. 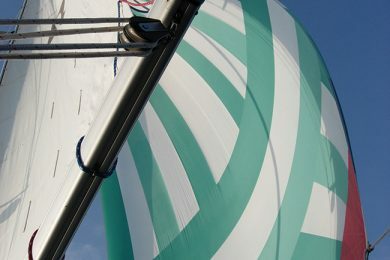 All lines, halyards and sheets lead aft to the cockpit so you can manage everything in safety. The seat backs are quite high and angled for comfort. Line pockets offer a neat place to store halyards, control lines and the main sheet to cut down on spaghetti on the cockpit floor. 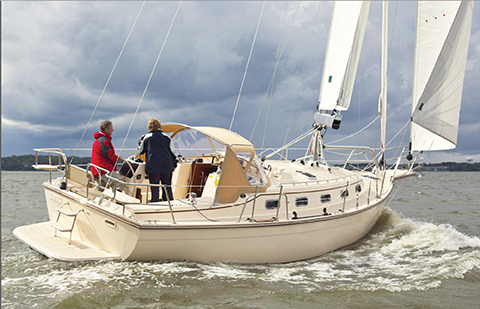 IPYs are really designed for long haul sailing and cruising and in that capacity the term “performance” takes on a slightly different meaning. 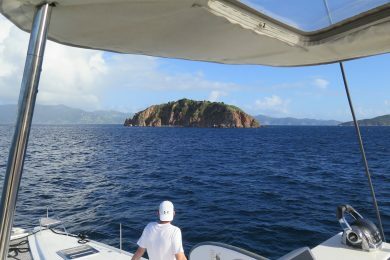 Real cruising performance means that you will make safe and reasonably fast passages, be comfortable and secure in bad weather and make landfall rested and uninjured. 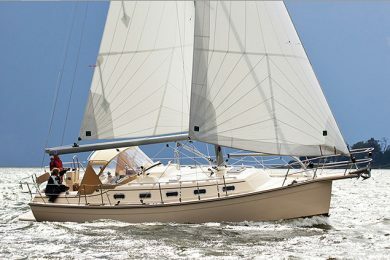 Like the IPYs before her, the new 349 will fulfill this promise of performance very well. 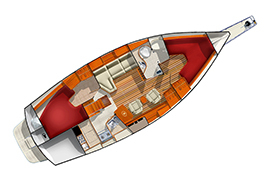 The 349 is a two-cabin boat with a V-berth forward and a larger double berth aft. The aft cabin will probably be the master cabin but the forward cabin could fill this role, too. The berth aft has a cut out which makes it easier for grown ups to get in and out of bed without disturbing their partner. The single head is forward and offers a separate shower stall, something you don’t usually see on a 34-footer. 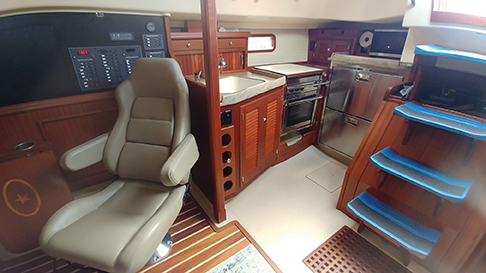 The galley is aft to starboard and has a two-burner stove, large sink and extra-large fridge. Although a tight space, the galley will work really well at sea since there are many places to brace a hip or to lean against something while working in bouncy conditions. 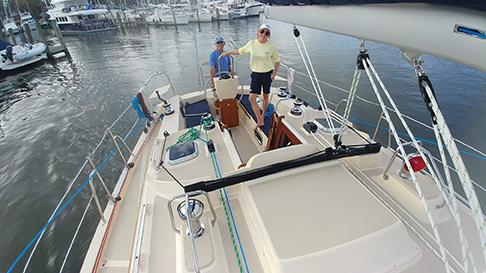 The sink is fairly near the boat’s centerline, so it will drain on both tacks and won’t fill with sea water when the boat is heeling over on the port tack. 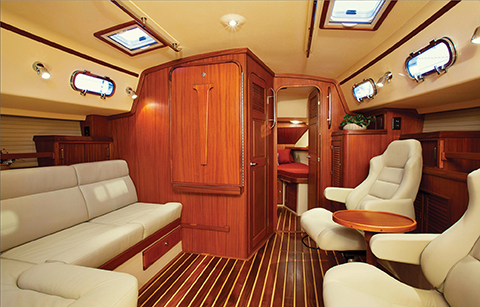 The saloon has an L-shaped settee to port and twin swiveling easy chairs to starboard. The dining table folds away against the main bulkhead when not in use so the whole ambience of the saloon is open and spacious. The chart table, which can be folded away when not in use, is just forward of the galley and faces aft; you sit in the aft swivel chair when working there. 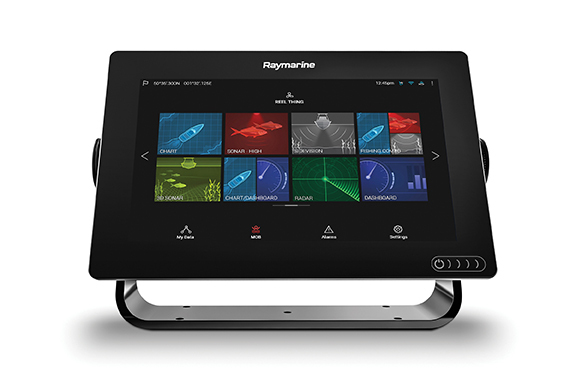 Radios, repeaters and other instruments can all be mounted in the cabinet just outboard of the chart table. The 349 carries 100 gallons of water so even long range cruisers would not necessarily have to install a watermaker. Still, if you did require one, then it could be mounted in the sail locker in the starboard quarter or, perhaps, under the aft berth. 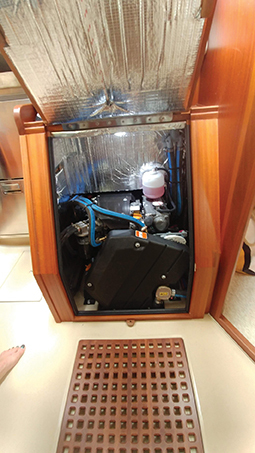 Access to the engine compartment is via the lifting companionway stairs and through side doors that allow you to get to the oil dipstick, filters, coolant tank and alternator. If you are going to upgrade to a higher capacity alternator, a small-case, 120-amp unit will fit easily and that is all you will need for a boat of this size and relatively low level of complexity. Darrell and Leslie have kept the overall styling of the new line of IPYs that they are building very much in the traditional IPY family. But, that said, they have also made dozens of small improvements to the boats stemming from their many years as IPY dealers in San Diego. The 349 is still trimmed with a lot of teak down below, has a teak and holly sole, and solid wood bulkheads, doors and drawer fronts. 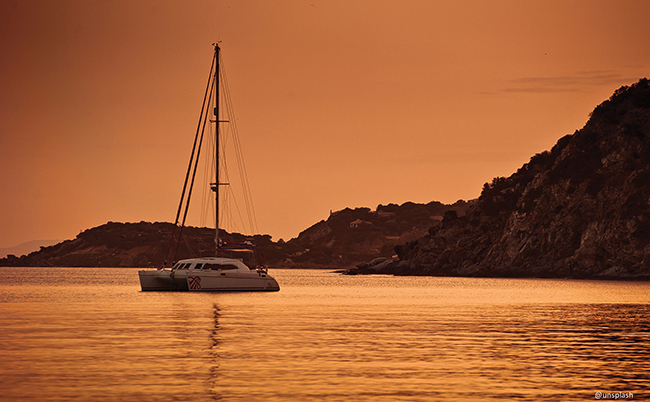 The quality of the boat is as good as ever and in many cases even better. 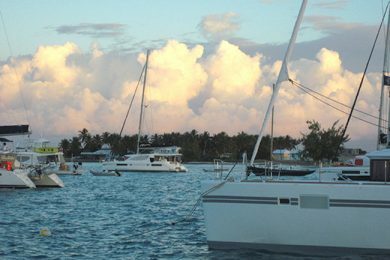 For couples who are looking for a true pocket voyaging boat that will honestly and safely take them across oceans or around the world, the new IPY 349 is a great choice. It has enough storage for the long haul, a sold fiberglass hull and full keel for safety in a grounding and a simple, efficient and manageable rig. And, it comers well equipped at under $300,000. 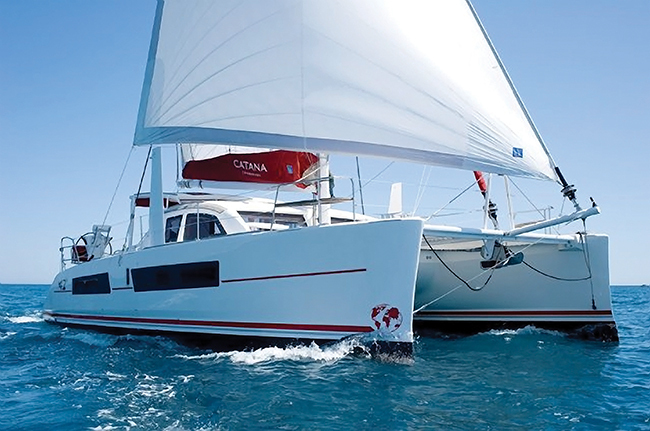 If you are ready to go small and go now, the new 349 may just be the boat for you. Sail area 763 sq. ft.